Members of the phylum Cycadophyta, cycads are descendants of giant, prehistoric seed-bearing, nonflowering plants that thrived when dinosaurs lived. Palms are flowering plants with primitive origins that share characteristics with cycads but are not related to them. Cycadophyta is one of the four phyla of gymnosperms in the kingdom Plantae. At one time, cycads grew on every continent. Fossil cycads have been located in areas where no modern cycads grow, such as Antarctica and Europe, suggesting that those places once had milder temperatures. The oldest cycad fossils are 245 to 208 million years old, from the Triassic period. The first cycads are believed to have appeared in the Permian period 270 million years ago. Some botanists hypothesize that cycads originated as progymnosperms in the Devonian period about 408 million to 360 million years ago. During the Jurassic and Cretaceous periods (65 million to 195 million years ago), cycads flourished on earth, dominating plant life. With the beginning of the Ice Age, cycads gradually diminished in population but did not disappear. Some Paleozoic- and Mesozoic-era cycad genera became extinct. Modern cycads are classified in 150 to 200 species, 11 genera, and 3 families. The most commonly seen cycad species belong to the genus Cycas and exhibit some structural characteristics found in palms, conifers, and ferns. 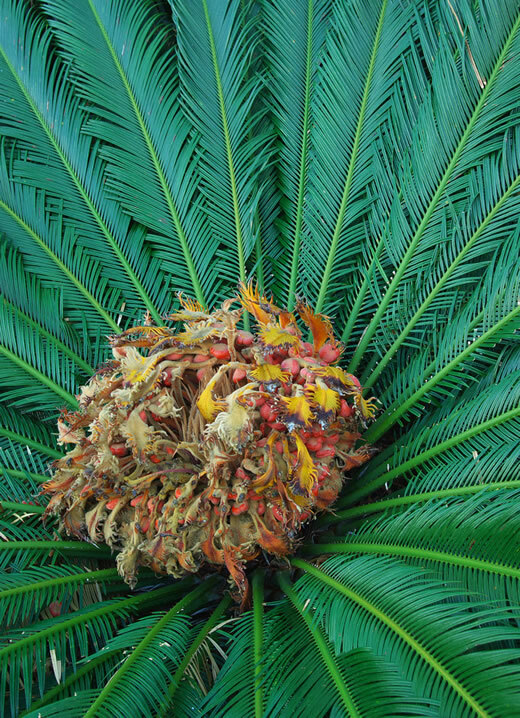 Botanists consider cycads valuable in the study of plant evolution. Modern cycads live primarily in the tropics and other regions with warm temperatures and high humidity and are indigenous to Asia, Africa, Australia, and Latin America. 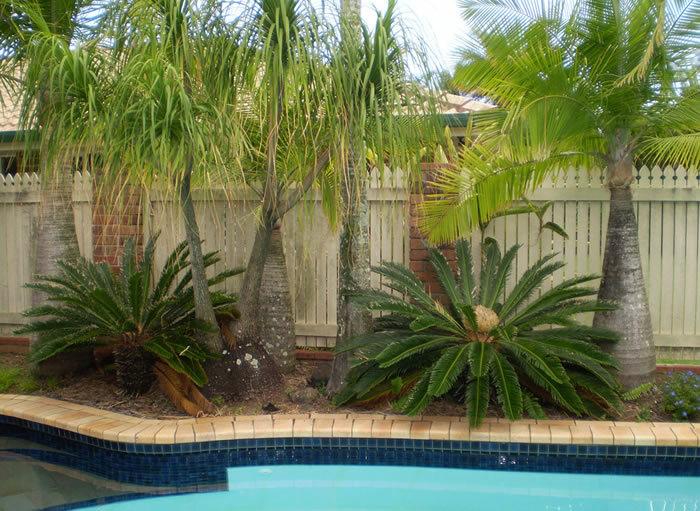 Growing in Florida, Zamia integrifolia is the only North American cycad species. Cycads consist of a stem with large, long, narrow leaves similar to palm fronds, gathered at the top in a circular crown. Seeds are located in cones on branch ends. Trunks vary from tall stems as high as 20 meters (66 feet) to short trunks standing about 2 meters (6.5 feet). Some have tuberous stems below the soil surface. Atrunk’s base and crown are of almost equal thickness. New leaves are tender, hardening as they mature, and their bases form armor on stems. They vary in length from 20 centimeters to 3 meters (8 inches to 10 feet). Cycads lack growth rings, but their age can be estimated by counting the number of whorls on leaf scars on stems to determine how many annual or biennial leaf productions have occurred. Using this method, botanists have speculated that it is possible, although rare, for some cycads to have life spans of one thousand years. Seedling cycads have a taproot that is later replaced by secondary roots called coralloid roots, and subterranean stems anchor the above ground stem to the soil. Some roots have bacteria which manufacture helpful amino acids and fix nitrogen. The Zamia pseudoparasitica is the only epiphytic cycad species. The reproductive cycle can last as long as fourteen months. Female and male cones grow on separate cycads. Pollen with spermatozoids, which are motile sperm, is produced in male cones and fertilizes female cones. Insects (not wind, as was believed until 1993) deliver pollen. Cone-generated heat creates a minty scent appealing to insects. Each cone can produce as much as 200 cubic centimeters (12.2 cubic inches) of pollen annually. Seeds are scattered when cones fall apart. Only fertilized seeds germinate. Seedlings often require several years before their trunks emerge from the ground. Cycads aid scientists in developing theories about reproduction of extinct seed plants and provide insight on how insect pollination evolved. Such pollination occurred prior to the existence of angiosperms, or flowering plants (the phylum Anthophyta). Although cycads and palms can outwardly resemble each other, palms are members of a different phylum and family, the family Arecaceae within the phylum Anthophyta (angiosperms). The earliest known palm fossils are eighty million years old and from the Late Cretaceous period. Fossilized palms with pollen indicate that these plants were some of the earliest flowering plant families. Palms thrived during the Eocene epoch, and a variety of primitive genera grew in Asia, Europe, and North America. Most modern palms live in forests, deserts, swamps, and mountains of tropical regions in Asia, Africa, the South Pacific, the Mediterranean Basin, and the Americas. Some species are confined to specific islands, such as the Maxburretia gracilis on the Langkawi Islands. 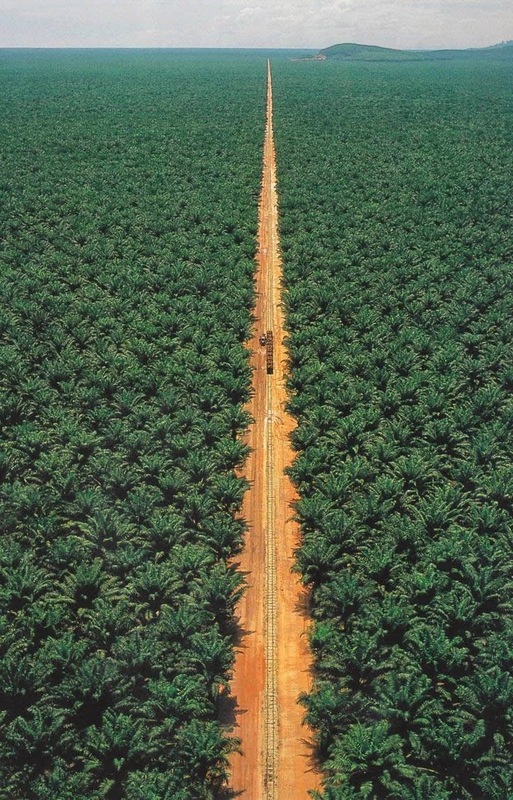 Some palm stands cover hundreds of square miles and consist of millions of plants. Structurally, palms are similar; all have slender trunks.Most species lack branches and have a leafy cluster on top. Some palms are as tall as 30 meters (98 feet). Seedlings grow a large tip, and most of the bulk forms underground. Upon maturity, trunks maintain the same diameter. Coconut palms have an average diameter of 45 centimeters (18 inches). A network of roots both above and below the surface secures trunks to the ground. Palms are mostly vertical, although some grow horizontally or like vines. Some climbing rattan palms are 182 meters (597 feet) long. Palm stems consist of masses of densely compacted fibrous strands. Leaves grow from nodes at the tips of stems, causing sharp scars when leaves are shed. 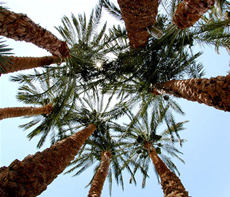 Date palms have leaves 3 meters (10 feet) long, and coconut palm leaves average more than 4 meters (13 feet) long. Leaf production offers hints about the age of palms, which average 50 to 100 years, with some Lodoicea maldivica attaining 350 years and an Australian Livistona eastonii reaching 720 years. Palms first produce seeds approximately eight years after germination and mature at age thirty. Palms have masses of small flowers, often numbering in the thousands,which are composed of sepals, petals, and male stamens. The female pistil in flowers either forms a soft, berrylike fruit, containing one or more seeds, or a more rigid fruit (a coconut or date), referred to as a drupe, which has a husk and shell encasing one seed. Insects, bats, and wind pollinate palms.Animals eat the fruit, distributing the seeds in their feces. Sago is a starch extracted from the stems of palms and cycads. It is used for cooking after the alkaloid is removed. Some leaves and seeds are also edible, but many seeds are poisonous. An amino acid produced by cycads, B-methylamino-L-alanine (BMAA), causes dementia in people who ingest the chemical. Researchers have attempted to discern why cycads manufacture this neurotoxin and do not react like other plants to its presence. The mapping of genes for susceptibility to BMAA may one day help to treat people with neurodegenerative conditions. Cycasin, the carcinogenic compound methylazoxymethanol, a glucoside found in cycad seeds, is also toxic. Palms yield vegetable oil, waxes, sugars, fats, and saps which are distilled into liquor. Dates and coconuts are popular foods produced by palms. 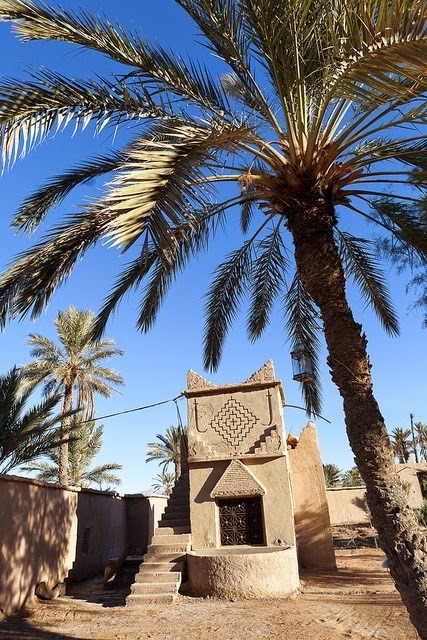 A date palm produces several hundred dates yearly. People consume stems, leaves, nuts, and roots. Rattan palm fibers are used for making furniture, baskets, bags, and other items. Some palm wood is appropriated for veneers, cups, and canes. Coconut palms can each grow more than one hundred nuts annually. Palms provide essential nutrients for many world populations. Oily coconut liquid and coconut milk are considered delicacies. Leaves from coconut palms make useful thatching material. Coir, the husk’s fiber, is twisted into rope. Coconuts have meat that is eaten or processed into copra for candles, oil, and other oil-based products. Palm products are crucial in regional and global trade. Cycads and palms are used ornamentally for landscaping gardens. Some species are suitable for bonsai in interior displays. Because they are often poached to meet collectors’ demands, cycads risk extinction. Smugglers locate and ship cycads (such as sago “palms”) to clients throughout the world. A limited number of licenses to gather and trade cycads and other protected plants are issued by the Convention on International Trade in Endangered Species (CITES), a 1975 agreement observed by 156 ratifying countries as of 2001 to establish protective legal guidelines to monitor international trade of approximately twenty-five thousand rare plant species and five thousand rare animal species. CITES forbids collection activities that pose risks to wild plant populations. In Hot Springs, South Dakota, Fossil Cycad National Monument was designated in 1922. In 1957 the site became the first national park service unit to be closed permanently, after collectors removed all of the 120-million-year-old fossils from a prehistoric cycad forest. Cycad conservation efforts include guarding habitats and artificially propagating species. Rare specimens such as the South African Encephalartos woodii cycad, of which only thirty-eight, allmale, specimens existed in 2001, are implanted with microchips to track their shipment to botanical exhibitions. Nong Nooch Tropical Gardens near Pattaya, Thailand, has one of the world’s largest collections of Asian cycad and palm varieties. Botanists saved an undescribed cycad species that grows on limestone cliffs from being destroyed when limestone was gathered for construction material in Bangkok. The gardens hosted the 1998 International Palm Society Biennial and the 2002 Sixth International Symposium on Cycad Biology. In South Africa, the Modjadji Cycad Nature Reserve has both cycads and palms, including the largest stand of the enormous Encephalartos transvenous (Modjadji palm).